In the past, women often gave birth to their children alone. It was not until the ’80s that expectant fathers began to accompany their wives during childbirth. Today it is commonplace for fathers to be present during the birth to support their partner and be part of this unforgettable moment. 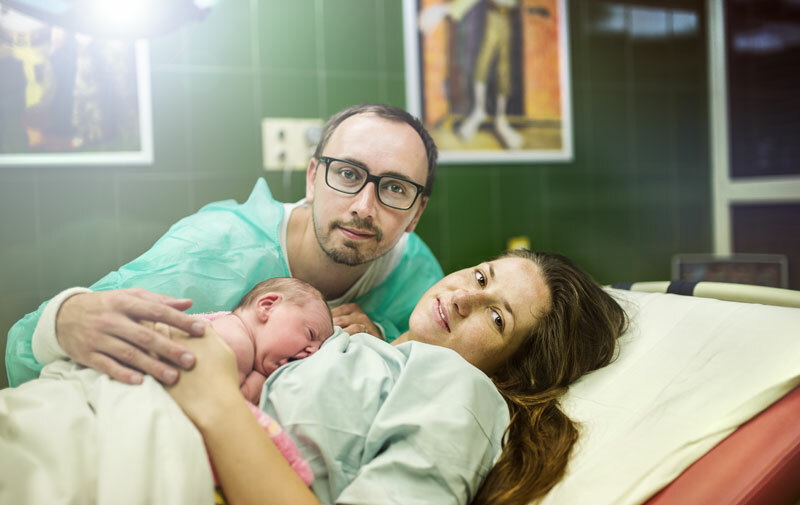 In the Western world, around 90 percent of men are in the delivery room during childbirth, but is it always beneficial for men to be present during this very important yet highly stressful experience? The strain and severe pain associated with childbirth makes it a tremendous challenge for any woman. Men often feel helpless in this situation because they are unsure about how to support their partner during these difficult hours, while pregnant women rely on an understanding support person to help them cope with their pain and fear. For men, it can be difficult to see their partner so helpless and racked with pain without being able to do much. Especially if the birth does not go as expected or complications arise, fathers often feel overwhelmed. Even the birth itself, which often involves seeing blood, an episiotomy and the placenta, can be traumatic to watch for many men. Such birth trauma can lead to a subsequent loss of sexual desire as it may cause a mental block. There are many reasons why men may not experience the birth as positive. Multiple studies have been conducted on this topic. One study by the University Clinic Bonn in which 171 men were interviewed after the birth found that almost a quarter had found the experience terrible. In the worst cases, fathers can even develop postpartum depression after childbirth. This manifests itself through sadness, insomnia, listlessness and a lack of sexual desire. The renowned French obstetrician Michel Odent has witnessed this distressing psychological condition in many men who were present during the birth and who were drastically changed by the experience. According to Odent, the presence of the father during childbirth can also be problematic for the mother because she may feel more inhibited and have a hard time letting go. Another study conducted at the Case Western Reserve School of Medicine in Cleveland, which lasted 15 years, showed that women who were accompanied by a female friend during delivery were half as likely to have a caesarean section and were 60 percent less likely to request an epidural. Labor was also 25 percent shorter. In addition, the University of Bath found that anxious fathers had a negative influence on their wives during cesarean sections, which caused them to perceive the procedure as more painful. A survey by the British Royal College of Midwives also found that 38 percent of women would like to have a person other than their partner present during childbirth. Preparing for childbirth is not only crucial for expectant mothers—fathers should also know what to expect during the birth ahead of time. This allows men to get an idea of what the birth will be like, how they can best support their partner and what do to in case of unforeseen events. Attending special childbirth classes for expectant fathers is already common practice in the US. In these classes, men can discuss their fears and concerns about the birth that they may not be able to share with their wives. If applicable, fathers should also get to know the midwife and be included in the preparation process by her. This helps men understand that their partner’s behavior and emotions during labor are perfectly normal. After delivery, men should also be cared for by the midwife so that they can discuss and process the experience. So should the father be there for the birth? Ultimately, expectant fathers need to decide for themselves if and/or how long they would like to be present during the birth or if it might be better to choose someone else to act as their partner’s support person during labor. Women should not put pressure on their husbands—after all, no one benefits if the father is only in the delivery room out of a sense of duty and feels overwhelmed by the situation. On the other hand, men should also accept if their partner would prefer to be alone during the birth or be accompanied by a different person for support. Even though childbirth can be a highly stressful and even traumatic event, many men describe this moment as the most beautiful and intense experience of their lives.